Highlights of the International Missionary Day held in AATF Sports Complex, Malagasang, Imus, Cavite last January 13, 2019. Highlights of the Summer Youth Camp 2018 Opening Service, held in AATF Sports Complex in Malagasang, Imus, Cavite. 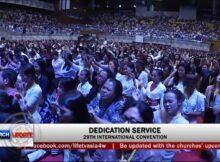 Closing ceremony highlights of 28th International Convention. For the first time in history, internationally renowned Gospel artist Steve Green will be performing live at the AATF Sports Complex in Imus, Cavite on January 13, 2018!